Age Played A Bigger Role In The NFL Draft. It’s About Time. Sam Darnold was the youngest of the first-round quarterbacks taken in the 2018 draft. NFL teams leave no stone unturned when it comes to scouting top players for the draft. They scour college tapes, career statistics, physical attributes, intelligence tests, personality traits, social media accounts and school transcripts. By the time draft day arrives, NFL teams know if a player ever stepped out of line in middle school. But there’s one very obvious piece of information that teams seem to be changing their tunes on before choosing the players who can make or break a franchise: their birth certificates. 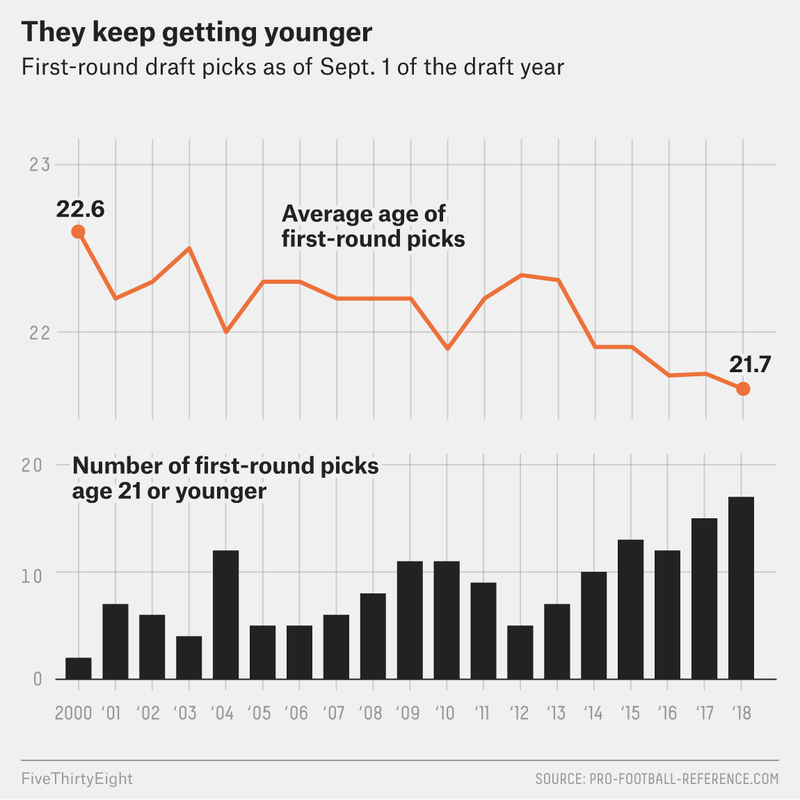 In last week’s NFL draft, teams seemed to be saying “younger is better” when it came to the top picks. Seventeen of the 32 players selected in the first round will be age 21 or younger on Sept. 1 — about when their rookie season will begin. This is the highest number this century.1 And it’s not a one-year fluke based on this draft’s talent pool: It’s the continuation of a trend. From 2000 through 2013, the average draft saw seven selected players who would have been 21 or younger at the start of the regular season. Since 2013, that number of prospects barely old enough to drink on opening day nearly doubled to an average of 13.4. Last year’s 15 was the second-highest this century. What caused such a dramatic change? The rookie wage scale instituted with the 2012 draft, which gives first-round selections a fixed, four-year deal based on where they ended up in the draft, plus a club option for a fifth year. Prior to that, college players projected for the first round but not as the top picks had more of an incentive to stay in college and improve their stock in order to demand a higher initial salary. But with that negotiating power gone, more pro prospects now want to get into the NFL as quickly as possible and set the clock in motion for their second contract, where they can make the most money. Obviously, the younger you are when that rookie contract and option year expire, the more earning potential you have. The number of younger players declaring as underclassmen has increased dramatically ever since. From 2000 to 2011, the last year of the old collective bargaining agreement, an average of 49 underclassmen entered the draft per year. But since the 2012 draft, that average is up to 87. This year, there were a record 106 underclassmen who declared. But younger prospects expected to be first-round picks have regularly left college early — in fact, those who stayed in school have often garnered the bigger headlines. So the increase in top-drafted underclassmen isn’t completely explained by the overall increase in players declaring. Teams also finally appear to be looking at how underclassmen actually performed rather than knocking them down a peg or two for leaving school “before they can refine their skills” or develop “emotional maturity.” Even a quarter of a century after underclassmen eligibility was granted, NFL coaches praised for innovation and an intimate knowledge of the college game were still stating a general preference for seniors. The more interesting question then is not why more young players are being targeted now but rather what teams were doing for all those years. Looking from 2000 to 2013 (the most recent draft year for which no first-round pick could still be on his rookie contract, including an option year), younger first-rounders were most successful. To measure this, we can use Pro-Football-Reference.com’s weighted career approximate value (CarAV), which rewards a player for his contribution to a team’s points scored and prevented as well as overall performance in other key statistics. While younger players were drafted only slightly higher in this span on average, this variance could be at least partially attributed to selection bias. Players who are good enough to make the NFL at this age are probably just better in general than the older players. But at the same time, each player taken in the first 32 picks of the draft is elite regardless of whether he’s a senior or a junior. So if age is a factor in the success of a draft pick, the Bills’ selection of the first round’s youngest player, Virginia Tech linebacker Tremaine Edmunds, seems a lot smarter. Conversely, the Ravens tabbing the round’s oldest player, soon-to-be-25-year-old tight end Hayden Hurst of South Carolina, seems more questionable. But what about age at the game’s most important position, quarterback? This is the one position where the pros and cons of age are arguably most balanced. Older quarterbacks may be ready to slot into an offense right away if that’s what a team needs, while other teams may have the luxury of letting a younger player carry the clipboard for a while — something that can’t always be done at other positions. Using CarAV again, we see the effect of age at quarterback as even more pronounced — albeit with smaller sample sizes. No 20-year-old quarterbacks were drafted in this span. The six signal callers age 21 and younger by September of their draft year have by far the greatest average value, at 75. And it’s not just Aaron Rodgers, who has posted a 128 career approximate value. Alex Smith (93 CarAV), Matthew Stafford (85) and the retired Michael Vick (93) were also successful picks at this age. This would be good news for the team that this year took the youngest of the highly drafted passers, the Jets with soon-to-be-21-year-old Sam Darnold. The returns diminish dramatically with the 10 QBs at age 22, even though they were drafted higher on average (seventh versus ninth). And the bust rate (players with a CarAV below 40) increases from 33 percent to 50 percent. Likewise, 11 of the 18 picks (61 percent) at age 23 were busts. This age 23 group houses some of the most notorious draft disasters in this time period: Tim Tebow, Christian Ponder and Jake Locker were all 23 by Sept. 1 of their draft year. Locker, drafted No. 8 overall in 2011, was so tired of football that he walked away from the game at age 26. All of this could be a red flag for the first overall pick and oldest first-round quarterback, new Cleveland Brown Baker Mayfield, who turned 23 last month. Darnold will be entering his third season when he’s the age Mayfield will be this year as a rookie. So while Mayfield may end up being the draft’s most pro-ready passer, Darnold may just end up with the more productive career. The league changed the rules on underclassmen in 1990, but rules on free agency and the salary cap further changed the league in the 1990s.